Hundreds of people joined the Cycle on the Senedd in Cardiff today to call for a doubling of investment in active travel. They heard pledges of support from representatives of all four major parties. 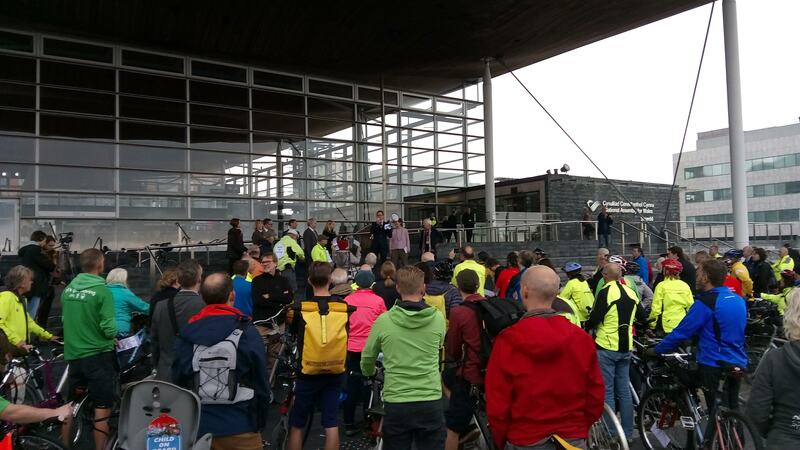 The steps of the Senedd were crowded with people who had got on their bikes to lobby Welsh Government to fulfil the promises made in the Active Travel Act. Lee Waters AM (Labour), David Melding AM (Conservative), Dai Lloyd AM (Plaid Cymru) and Cllr Rodney Berman (Lib Dem) all backed the aims of the lobby and highlighted the huge health and environmental benefits that proper investment in active travel could mean for Wales. The campaigners want investment in walking and cycling increased to £20 per head, as recommended in a recent report by the Assembly’s Economy, Infrastructure and Skills Committee. Welsh Government is currently spending just £10 per head, half of the level in Scotland. The lobby had the support of the British Heart Foundation, British Lung Foundation, Friends of the Earth Cymru, Living Streets, Oxfam Cymru, Sustrans Cymru, Welsh Cycling and WWF Cymru, as well as cycling organisations from across Wales.